I have been meaning to do a huge master post for all my highlighters for quite a while now. As you can tell I have a little bit of an addition to high end cult favourite highlighters and I'm honestly in love with each and every one of them. Benefit Highbeam $45: This is a gorgeous very finely milled highlighter liquid with a light pink undertone. It is gorgeous dotted and blended over the high points of the face and also mixed in with foundation. This one is particularly flattering on pale skin. Benefit Watts Up $53: This cream highlighter is a much warmer champagne gold colour. The formula is fantastic and it blends beautifully without shifting your base during application. The pretty warmth of this shade means it would suit most skin tones. Becca Shimmering Skin Corrector Liquid in Moonstone $66: The gorgeous bright yellow champagne tone of this liquid highlighter makes it a great versatile shade for every skin tone. Again, this is pretty layered over the high points of the face but is absolutely gorgeous mixed with foundation. Because the shimmer is so finely milled it gives the most flattering glowy wet look highlight. It is a bit of a splurge but it is worth it. MAC Mineralise Skin Finish in Soft & Gentle $47: The shimmer in this one is less finely milled but the colour is what makes it really special. The peachy gold tone makes it universally flattering and it also lasts really well throughout the day. TheBalm Mary-Loumanizer $29.95:If you are looking for a super intense bright champagne highlighting powder this should definitely be your pick. In addition to be one of the more budget friendly but still exceptional quality options, it also has a quite unique smooth buttery formula that blends really well. Becca Shimmering Skin Perfector Pressed in Moonstone $60: My newest and most intense love, this very fine gold shimmer powder demonstrates why Becca highlighters are a cult favourite. It has an incredibly smooth formula that you can apply quite subtly or build up for a more intense strobe look. Everyone really needs to treat themselves to at least one Becca highlighter because they are truly lovely. Dim Light $66: The formula of the Ambient Lighting Powders is super fine so if you are looking for a very subtle everyday highlight that just adds a tiny bit of glow to the skin these are a great option. Dim Light is a beautiful muted gold shade that can either be used as a highlight on light to medium skin tones or as an all over powder when applied very lightly. Incandescent Light: This exclusive palette shade is much brighter with just a hint of gold to avoid any white cast. It is absolutely stunning as a highlighter but I sometimes use this on my under eye area as well to really brighten up the area. Radiant Light $66: On my exceptionally pale skin I actually use this a slightly shimmery bronzer but it would also make a beautiful highlight on medium to dark skin tones. So there you have my entire highlighters collection with the exception of the sold out limited edition Laura Mercier Indiscretion. I really do alternate between all of these because they are all exceptional. I also really recommend having a mix of liquid and powder highlighters because they give a different effect. Liquid highlighters in particular can be quite versatile and look stunning mixed with foundation for a really dewy and glowy look. 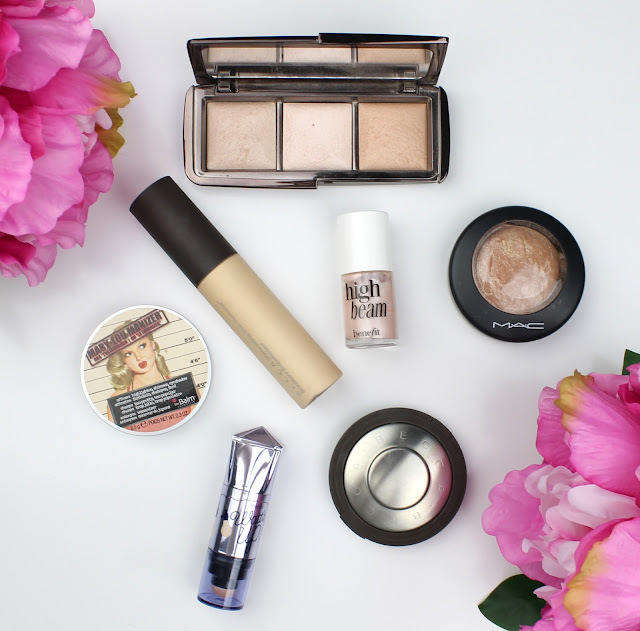 Do you have any of these gorgeous highlighter or some others that I simply have to check out? Let me know below in the comments. 11 comments on "My Highlighter Collection"
Gorgeous collection! I'm tossing up on whether I need soft and gentle! I've wanted it for what feels like forever but since my highlight collection has expanded, I've kind of forgotten about it? It's such a cult fave though and ugh it's gorg! Thanks :) Honestly, I do wish that Soft & Gentle was a little more finely milled because it does have some larger glitter chunks in it. It is an insanely beautiful shade. It has great peachy warmth to it. You don't NEED it, but it is really pretty. Such a great collection!! Mine has expanded like by about 5 or 6 highlighters since I did mine.. might be time to do an update.. haha I love the look of Watts Up, its the only one I don't have from your collection!! But no doubt I probably have something similar! Aw thank you :) Watt's up was actually the first highlighter I ever bought. Gorgeous collection! Mine is still growing but I have a few of these ones!